Eye-catching decorations? Check. Clever cake toppers? Check. Dramatic games? Check. Well-informed, witty conversation? With our printable party kits infused with fun and fascinating trivia from our friends at Mental Floss, that goes without saying! They offer the memorable experience of a party where a smattering of Shakespearean smarts (like the fact that the Bard invented many words, including the name “Jessica”) is the main attraction. Hamlet was never the life of the party, but if he’d staged our Shakespearean Soiree, he might have gotten all existential over his cupcake, wondering “to eat, or not to eat.” Cast a party full of drama, comedy, and history with this fanciful, Shakespeare-themed party kit. Inspired by the timeless plays of the Bard, it includes Hamlet's cupcake toppers, "sweets for the sweet" treat bags (also inspired by a line from Hamlet) placemats modeled on Macbeth's witches' cauldron where you can draw your own simmering potion, and amazing Shakespearean facts from Mental Floss that’ll bring the playwright’s lasting influence to life for you and your guests. Toast to the two largest moons of Uranus, named for Titania and Oberon, the Fairy Queen and King from A Midsummer Night's Dream, or celebrate the origin of the phrase “it’s Greek to me” (Julius Caesar) while you sip your drink. Each part of the kit provides simple yet detailed directions for crafting decorations, games, and special details that'll bring uniquely Elizabethan flair to your celebration. Recommended for groundlings age 5 to 105. 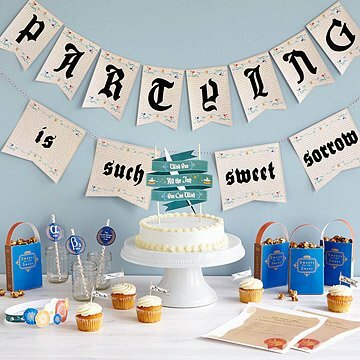 Click here for your free download of the Printable Party Kit - Shakespearean Soiree. I love this idea and I'm so excited to use the printables in my English classes. I took off one star as I noticed that the straw marker for the Greek letter sigma said "stigma" instead. Overall though, for a totally free product, I'm very pleased! Who gives away free stuff these days? You are the best! You just made an English teacher very happy. I came here for the Hamlet glass and got much more; I will be coming back to this site for sure.